I’m personally not a coffee drinker, but so many of my friends and family are, so I recently bought an espresso machine for when guests come over. In order to make the perfect coffee I also bought a coffee bean grinder so I can be the perfect host by making the perfect coffee. Not knowing a lot about coffee, I did have to spend quite a lot of time sifting through various coffee grinder reviews, learning about the types of coffee grinders to find the best coffee grinder for home use. Whilst I found it somewhat confusing at the time, I now like to think of myself as bit of an expert when it comes to espresso machines and coffee grinders! If you’re also in the market for the best home coffee grinder, then you will love this guide I put together. It contains everything I learned from my own research, so you don’t have to spend hours looking around at all the various coffee grinders for sale. 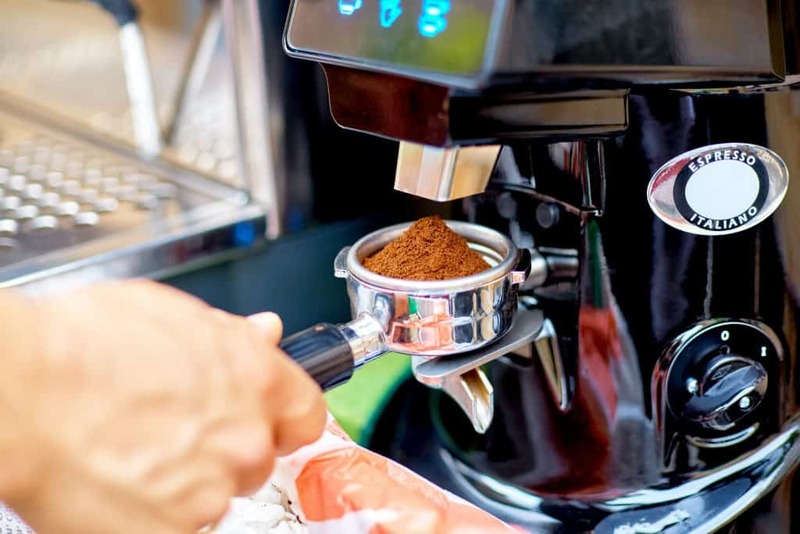 In this guide, I explain the different types of coffee grinders and what type of coffee machine they are best suited to as well as compare some of the best coffee grinders currently on the market. Click here to see the best coffee grinder now. So whether you’re after the best best burr coffee grinder, the best hand coffee grinder, best blade coffee grinder or just the best cheap coffee grinder, I have no doubt you will find just what you’re looking for in this coffee grinder guide. 2 Why Grind Your Own Coffee Beans? If you want to have the most delectable cup of brewed coffee every time then, as any experienced barista will tell you, the coffee grinder is a must have item. Poorly ground beans will negatively impact the taste of your coffee so having a reliable grinder is essential. To make the best coffee, you should grind the beans just before you brew the coffee. Coffee beans go stale the longer they sit there and grinding your beans and letting them sit only hastens this process. There are various factors that contribute to this process. However, the main ones are oxidation and moisture. Oxidation is what gives your coffee its unique flavors and aromas, and this process will continue until your coffee is brewed, so by grinding your beans yourself and immediately brewing the coffee you make the most of your delicious coffee beans. Since the moisture around your home dissolves the precious oils within your ground coffee, it is best to have these oils intact until your coffee is brewed. And lastly, your friends will be super impressed by how good the coffee is when they come visit you! Another advantage of having your own coffee grinder is the ability to grind your coffee beans to a different size, depending on the type of coffee machine you have. Extra Coarse Grind – Large pieces of coffee similar to the size of peppercorns, suited to a cold brew coffee, as this grind size is able to brew for 12+ hours in cold water. Coarse – Individually distinct chunky pieces of coffee, similar in appearance to sea salt. Coarse grind coffee is best suited to plunger pots, french press or percolator as medium to fine grinds will go straight through filters making your coffee muddy and sludgy. Medium-Coarse – This size is in between medium and coarse, like rough sand and is suitable for chemex, clever dripper or cafe solo brewer. Medium – Gritty texture, similar to sand. This grind is best suited to drip coffee makers with flat bottom filters. Medium-Fine – This grind size is in between fine and medium and is well suited to drip coffee makers with cone shaped filters. Fine – A smooth texture similar in appearance to table salt. This grind is also well suited to drip coffee makers with cone shaped filters. Very Fine – The finest grind is even finer than sugar and perfect for espresso coffee. Blade grinders use propellers to slice up the coffee beans into a fine grind. Whilst usually cheaper than a burr coffee grinder, blade coffee grinders don’t create a consistent grind size which can negatively impact the taste of your coffee. Pricier and bigger than blade grinders, burr grinders grind coffee into a chamber that is made from cones or discs with serrated edges. Burr coffee grinders are much more capable of producing not only a consistent grind size but also a finer grind than blade grinders. Burr grinders come in either a flat burr grinder or conical burr coffee grinder. A conical grinder has two cone shaped burrs with ridges that grind and crush the coffee, whereas a flat burr grinder has two sets of serrated rings of burrs. Flat plate burrs come on all sorts of grinders from cheap to top quality, whereas as the conical burr grinders are usually found on the low speed grinders. The best manual coffee grinder, or hand grinder, is portable and easy to pack up and take with you if you are going away. They are also much cheaper and the best hand coffee grinder is easier to clean. A hand coffee grinder is obviously a lot more effort than an electric burr coffee grinder which basically works as an automatic coffee grinder doing the whole job for you with the flick of a switch or click of a button. Before purchasing a coffee grinder you will need to determine what size you need. Will you just be making a quick coffee for yourself before work or will you be making one for the whole family to wake up to? Capacity size (referred to as the bean hopper size) is important because it defines how much coffee you can grind in one go. The larger the bean hopper compartment, the more beans you can put in to grind, saving you from having to repeat the procedure many times to make multiple coffees. Generally speaking the higher the wattage the better the coffee grind and coffee brew each time. A top quality coffee grinder will usually be around 300 watts, whereas the average coffee grinder is closer to 150 watts. The number of grind settings is another important factor to consider as you will then be able to perfect how you grind your coffee to exactly the way you like it – every single time. Some coffee grinders come with simple buttons for a quick and instant grind and brew for the on-the-go person, whereas there are other grinders with more fine and precise setting options. Coffee grinders vary in how complicated they are to use and clean so make sure you purchase a coffee grinder that is easy to clean. 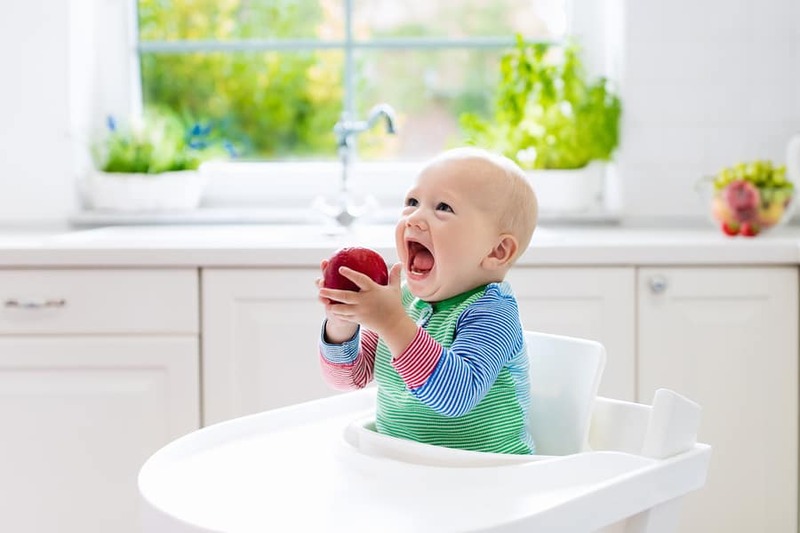 If you know you’ll be frustrated by a machine that makes you take extra steps each day to use, or that always involves a lot of time to get clean, then take some time to read reviews about the product before making a purchase. I’d recommend purchasing a quality reliable coffee grinder that’s going to last you for years. Usually grinders with ceramic burrs are designed to last longer than steel burrs, however the best way to determine the durability of a grinder is to read various customer reviews. The Breville Smart Grinder, is the perfect grinder for an espresso machine or french press, giving you a consistent cup of coffee every single time. This Breville coffee grinder is a conical burr grinder and is made from brushed stainless steel. The grinder is designed to efficiently minimize grinding heat in order to help protect the essential oils in the coffee beans, giving you the most delicious cup of coffee. With this grinder you have the ability of choosing from 25 different grind settings to be able to get the perfect cup of coffee depending on your preferences. It also gives you the option to go from a very fine espresso grinder to a coarse french press coffee grind. Other great features of this stainless steel coffee grinder are the Precision Digital Timer (adjustable in 0.2 second increments), 450g coffee bean capacity, two grinding cradles and an airtight storage container. With so many great features it is easy to see why this is a great choice for the best coffee grinder for espresso or french press. Read any Breville coffee grinder review and you will see many happy customers reporting what a great quality coffee grinder it is and that it makes a fantastic drip coffee as well as espresso. A perfect choice if you’re looking for the best value coffee grinder. This stainless steel Sunbeam Cafe Series Coffee Grinder is another perfect choice for anyone looking for a good value coffee grinder. This Sunbeam coffee grinder users a belt drive and dual bearings to minimize any conical burr movement to ensure accurate and consistent grind size and coffee flavour. There is also a choice of 30 different grind settings to ensure you can brew your coffee just the way you like it. Other great features of this coffee grinder include the auto light feature which illuminates the work area, removable bean hopper with a 450g capacity, reduced noise with a belt driven motor, as well as an easy to clean removable top burr cartridge and a 1 year warranty. If you’re looking for a coffee grinder which produces a consistent grind every time, look no further than the Sunbeam Cafe grinder. If you want a barista style coffee in the comfort of your own home, then the DeLonghi coffee grinder will help deliver the perfect brew. With 18 variable grind settings your choices will not be limited. Espresso, drip coffee, pour over or french press coffee, you can have it all. You can even adjust the strength settings from light, normal or strong so you will be able to cater to anyone’s liking. Grind directly into the storage carafe which can hold enough for 14 cups of coffee or into the espresso filter depending on your requirements. The digital LCD displays also makes using this grinder super easy and cleaning is a breeze with the removable upper burrs. This stylish stainless steel conical burr grinder is just what’s required for that professional brew in your own home. If you’re in the market for a ceramic coffee grinder then look no further than the Baratza coffee grinder. Combining ease of use and a sleek appearance this grinder knows how to bring out the flavours of your beans. This professional grade Baratza grinder will fit anywhere from your kitchen, office to your cafe. The slim design makes it perfect if you’re looking for a small coffee grinder but with all the capabilities. With 230 distinct grinding options it’s not hard to see why this award winning grinder is preferred by specialty coffee makers. The unique ceramic flat burrs provide fast grinding and will remain sharp for twice as long as the best steel burrs, whilst the three user programmable buttons and digital timers provide for the perfect dose every single time with the touch of a button. This grinder is for the serious coffee drinkers and, although you may have to outlay more to start with, the quality and durability will have you sipping on the finest coffee for years and years to come. The perfect grind will be a few steps away with the Cuisinart coffee grinder. The easy to read LCD display shows time, fineness and number of cups to ensure every grind is of the highest quality. 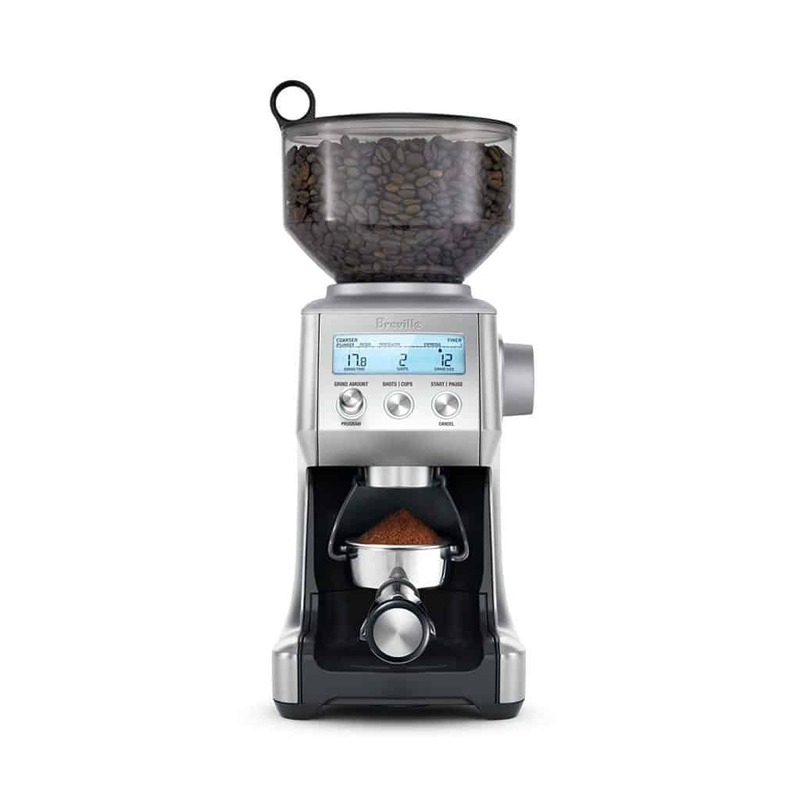 With 18 positions this conical burr grinder ensures the beans are ground uniformly to maintain their natural flavors and oils and automatically stops after the correct amount has been ground. Grind your beans ultra fine for espresso to extra coarse for french press, the choice is yours. With a fully programmable hopper, you can select anywhere from 1-14 cups so if you need to make a large number of coffees this grinder won’t let you down. Other features include a removable grinder chamber for easy cleaning, heavy duty motor, cord storage facilities and a scoop and cleaning brush. 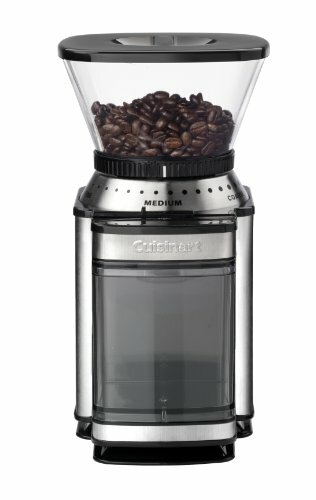 If you don’t want to mess around grinding your beans each morning this easy to use and store grinder will make your morning coffee that little bit simpler. To ensure the best flavour of your beans the Krups coffee grinder has taken all the steps to result in perfection. The burr mill system ensures the best grinding results without overheating the beans for that ultimate brew. The 9 setting grind options means you are in complete control; choose from very fine for espresso machines to very coarse to use in french press. The number of cups selector can also be adjusted depending on how many coffees you need to make. Store any left over grinds in the removable anti-static coffee container to preserve freshness and flavor. Safety is also a big feature with this grinder. It will not work unless the lid of the hopper and the coffee container are securely in place and the unit will automatically stop once the desired amount has been ground. With the large capacity hopper on top, the grinder fills effortlessly and makes for easy access to remove the burrs for quick cleaning. If you want a perfectly balanced cup of coffee with unlimited options this grinder will be sure to deliver. Grinding your coffee could not be made easier with the Kitchenaid coffee grinder. This high powered 170w grinder is so easy to operate with a one touch control. Simply activate the grinder by pushing down on top of the unit, and once released the power ceases. The clear top cover allows you to easily see the grind consistency and can also be used to blend herbs and spices. Made from stainless steel, the blade offers durability and power and is perfect for those looking for a portable coffee grinder, weighing in at 1.3kg you will be able to take this grinder wherever required. Transfering your grinded beans is also made easy with the removable 125ml brushed stainless steel bowl which simply lifts out. With bowl measurement increments on the inside of 4,8,10 and 12 cups of coffee you can make enough for yourself or the whole household if required. With a name like KitchenAid you know you have a quality product but the price, simplicity and compact design speak for themselves with this grinder. Because fresh is always best to ensure great tasting coffee, grind only the coffee you need with the Sunbeam Cafe Series Grinder. With a conical burr grinder, you will be delivered with consistent results every time. You can even grind down to particle size to help achieve an even extraction. Simple to read dials means you can maneuver the lever to filter from fine espresso grinds to coarse grinds for french press or filter coffee. This stylish stainless steel grinder is compact in design and won’t take up much bench space but has all the functionality if you’re looking for a simple, well priced grinder. The elegant stainless steel Cuisinart Coffee Maker is essential for those wanting style and functionality. 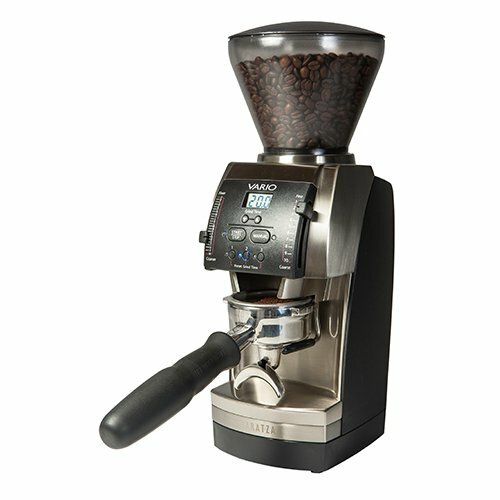 With 18 grind options and the ability to grind from 4 to 18 cups, the slide dials makes this machine super easy to use. The removable grind chamber also holds enough ground coffee for 32 cups so you will never be short of grinds. The bean hopper can also be removed for easy filling and makes this automatic grinder simple to use in all aspects. It also delivers on power with its 500w motor and comes with a scoop and cleaning brush as included accessories. If you’re looking for an automatic grinder but you want something with style then this grinder is the one for you. If you’re looking for the best budget coffee grinder then you simply can’t go past the Hario coffee grinder. Manually grind your beans with the ceramic conical burrs to ensure your desired texture with precision. With a non-slip rubber base to keep the mill in place during grinding, you can be assured your efforts will be rewarded with that perfect brew. The ergonomically designed handle makes this a great choice for a hand crank coffee grinder. The handle is also detachable for compact storage and easy transportation if required. Made from Hario heat resistant glass in Japan, this grinder is also dishwasher safe and makes for easy cleaning. If you read any hand coffee grinder reviews you will see the Hario Skerton rated highly. With great reviews from many happy customers reporting that this product is outstanding value but, most importantly, does a really good job offering a consistent grind. If budget and storage are vital then you can’t go wrong with this grinder. Although it may require some manual work it allows you to choose your own desired texture and means you will have full control over your beans for the perfect coffee for you. Read our full best espresso machine buying guide or check out our other buying guides here.